Interdisciplinary course brings disparate health professions together to provide health care consultations to low-income seniors. There’s an old parable that tells of a group of wise men unknowingly standing in a dark room with an elephant. Each is allowed to touch just one part of the unknown object to identify it. Afterward, the men debate vigorously: One is convinced the tusk is a spear; another thinks the tail’s a whip; someone argues the animal’s flank is a wall. It is only after sharing information and working together that they’re able to arrive at the realization that a giant pachyderm stands before them. It’s this collaborative spirit that is the foundation of interdisciplinary team-based health care models — also called integrated health care models — that is at the heart of the Interprofessional Geriatric Curriculum (IPGC), an innovative course that pairs USC health professions students with low-income seniors facing chronic illnesses. 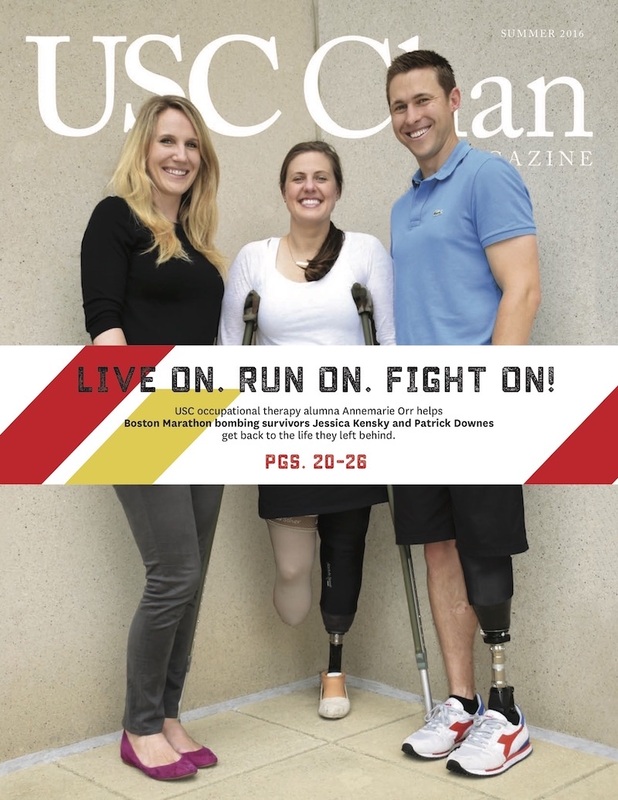 “IPGC provides our students with an interprofessional learning experience in which the distinct value of occupational therapy can really shine — to both our patients and to our professional colleagues from other disciplines,” says Ashley Halle ’08, MA ’11, OTD ’12, assistant professor of clinical occupational therapy at USC Chan and one of a handful of faculty members serving as advisers in the multidsciplinary course. IPGC began in 2011 with a $450,000, three-year grant from the U.S. Department of Health and Human Services awarded to the family medicine department at the Keck School of Medicine of USC, with Jo Marie Reilly, associate clinical professor of family medicine as co-principal investigator. Reilly envisioned using IPGC to teach primary care physicians how to work in interdisciplinary teams. Since then, the program has grown tremendously, adding disciplines and increasing the number of students enrolled. In total, nearly 400 future health care professionals have taken the course since it began. 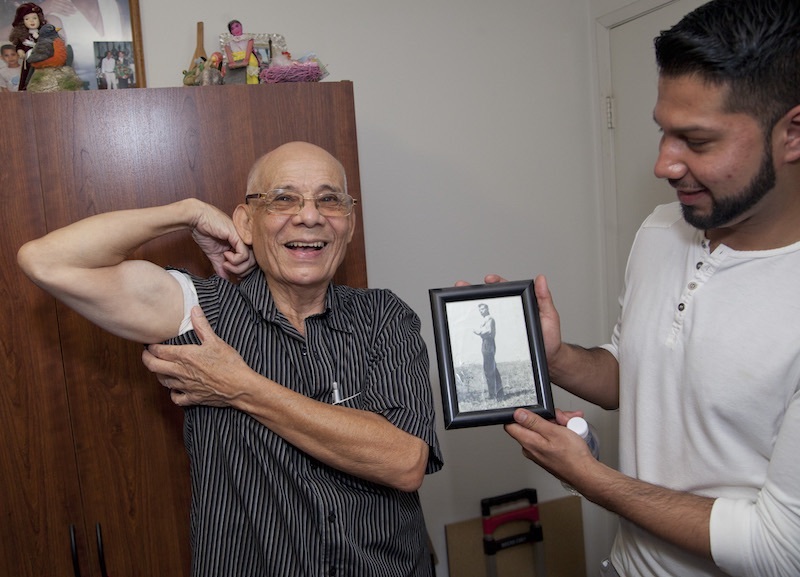 The course — an elective at USC Chan that will soon be integrated as an experiential assignment in a course on adulthood and aging — holds three sessions at low-income senior residences across Southern California. Its goal is twofold: to better educate students from dentistry, medicine, occupational therapy, physical therapy, physician assistant practice, pharmacy and social work about what the other professions do and to provide health assessments, exams and referrals for senior citizens. Senior citizens were chosen to “teach” the future health professionals because they often take many medications for a variety of age-related illnesses, making them ideal patients for multidisciplinary patient care. The class meets five times in total, with three sessions centered around actual patient health care consultations. One consultation session is dedicated to medication management and cognitive testing, another is focused on mobility and home safety and a third highlights oral health care and nutrition. Each class session begins with a didactic portion where representatives from each of the professions share with the group of about 90 students information about typical assessments their profession conducts that can be administered by any medical professional to better understand a patient’s overall health status. “Learning about the various assessments that other professions performed was helpful because, if present in the patient’s chart, I will now be able to recognize it,” says USC Chan student Lynn Kim MA ’16. 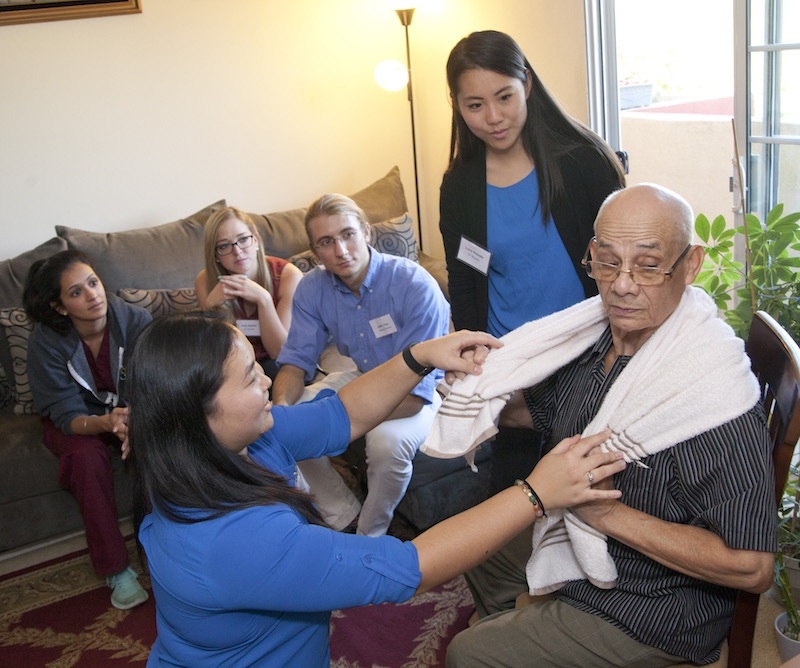 Afterward, the teams — comprised of at least one representative from each profession — and a faculty adviser visit low-income seniors in their apartments to provide home-based consultations. At the end, the teams discuss their observations and strategize how best to help the patient. 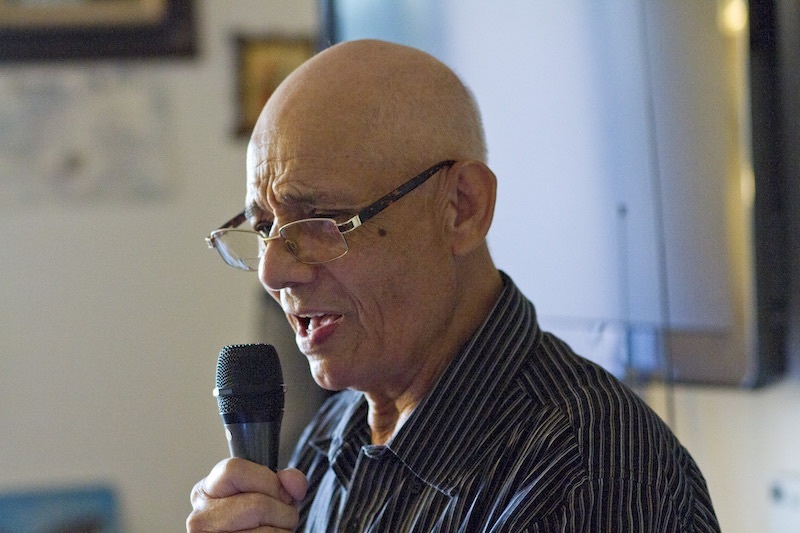 During Aguirre’s second session dedicated to mobility and home safety, the retired house painter complained of a stiff neck. The physical therapy student showed him a couple of exercises he could do with a towel to increase his range of motion. “Before, when I’d reverse the car and look over my shoulder, I couldn’t move my neck. Now, I don’t have any problems,” Aguirre says. He also talked about his wife who recently had surgery on both of her knees. “Because of her knee surgery, she’s delicate, and I’d obviously like to prevent her from falling and to care for her very cautiously,” Aguirre says, through a Spanish translator. The occupational therapy student toured his residence, pointing out hazardous areas — including floor rugs — that could lead to a fall. While the program proves beneficial to the seniors receiving health advice from a team of USC students, it’s what it can do for patient care that could make the biggest long-term impact. “Our students feel they communicate better, that they are better equipped to resolve conflicts, that they feel more assertive and better understand team dynamics,” Halle says. The faculty members behind IPGC hope the program continues to grow, so they can teach even more future health care professionals how to work collaboratively. “I actually would like USC to set up a Center for Excellence in Interprofessional Education, Research and Practice,” Resnik says, pointing out that integrating interprofessional education is now an accreditation standard for every single health profession at USC.